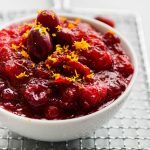 An easy homemade cranberry sauce with no refined sugar – perfect for Thanksgiving or Christmas! Stir cranberries, maple syrup, honey, water, and salt together in a small saucepan. Squeeze the juice from your orange slice into the pot, then tuck the orange rind and cinnamon stick into the cranberries. Turn the heat to medium-low. Cook, stirring occasionally, for 15-20 minutes until cranberries have burst and sauce has thickened. Top sauce with extra orange zest and reserved fresh cranberries (optional). Serve immediately or let cool and store in an airtight container in the fridge for up to a week. Use as large or as small of an orange slice as you like. I like to slice off a 1/2-inch-thick piece from the side of an orange (see photos in the post above) so I get a Tablespoon or two of orange juice plus the flavor from the rind. I like just enough orange-y flavor to bring out the tartness in the berries, but add as much or as little as you like! If you don’t have a fresh orange, you can add a few tablespoons of store-bought orange juice or substitute a splash of lemon juice or apple cider vinegar. This recipe makes a chunky cranberry sauce. If you like a smoother sauce, give it a few zaps with an immersion blender or pulse it a few times in a blender to smooth it out. To make this vegan, omit the honey and use all maple syrup instead. I like the depth of flavor I get from a mix of both honey and maple syrup here, but you can certainly use all one or the other! You can also substitute 1/3 cup of white or brown sugar for the natural sweeteners if you like. To make this recipe ahead of time, follow the recipe as written and let cranberry sauce cool completely. Store it in an airtight container in the fridge for up to a week or store in the freezer until you’re ready to use it. Let frozen cranberry sauce defrost for a day or two in the fridge, or place frozen cranberry sauce in a slow cooker or saucepan and cook, stirring occasionally, over low heat until warm. Serve cranberry sauce at any temperature you like: hot, cold and straight from the fridge, or at room temperature. What should I do with leftover cranberry sauce? I love making this cranberry mayonnaise (it makes the BEST turkey sandwiches!) You can also check out this video for some ideas of what to do with cranberry sauce leftovers. Can I freeze cranberry sauce? Yes! Cranberry sauce freezes excellently. You can store it in an airtight container (I like using my Stasher Bags or small mason jars) in the freezer for up to a year, although I recommend eating it within 3 months or so for maximum freshness.